I've long been a fan of Aromatherapy Associates. I haven't found another brand so adept at creating products that make me feel like I've been transported to the most luxurious spa on the planet. So of course I need to include a body wash from the line in this series ... and there isn't one finer than Renew Rose Body Wash. This delightfully fragrant body wash is formulated with chamomile to soften the skin, while rose and sandalwood oils keep it hydrated. Damask rose water nourishes the skin and leaves it soft and glowing. It even has aloe vera juice to keep skin feeling soothed! But it's the scent that really keeps me coming back for more. It's unbelievably fragrant and heady but not at all cloying. The scent fills up the bathroom each time I use it, but never gives me a headache or sinks into the skin so heavily that I feel claustrophobic throughout the day. It has such an accurate rose aroma that you'd swear you had just planted a rosebush in your vanity! And even better, it can double as a bubble bath! Just a few capfuls and your bathtub will be overflowing with beautifully scented bubbles. 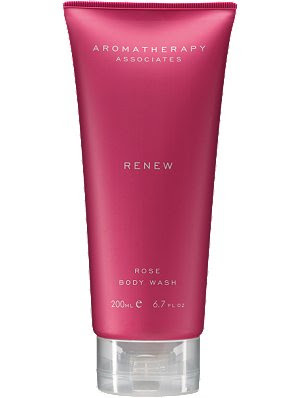 Aromatherapy Associates Renew Rose Body Wash retails for $42 at aromatherapyassociates.com. i really like this one also, though it is pricey, i use this and nbeauty.biz organic cleanser.